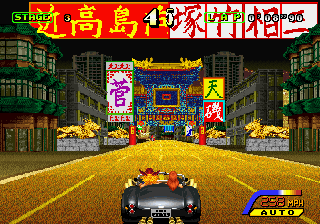 After a whole slew of disappointing semi-sequels, AM2 got behind the wheel again and brought back the graphics, the music and their characteristic style. 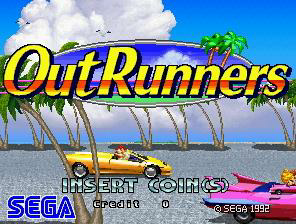 OutRunners was presented most often in its sitting cabinet form, usually linked to multiple machines for a maximum of eight players. There are eight cars you can choose from, each with different attributes and resembling real life cars like the red sprinter in the original OutRun. 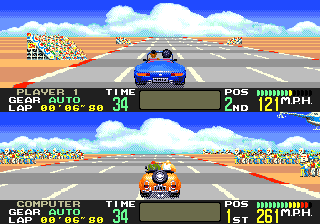 The drivers of the various cars are also different, making for additional unique ending variations. 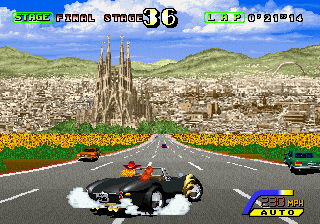 While the previous games covered North America and Europe, OutRunners has stages that cover the entire world. The game route still has the same “pyramid“ pattern it did back in the early days, but there are two completely different maps. There’s now an east side and a west side map, and the very first fork in the road (right after you start the game) will let you choose which of these two layouts you want to play through. This technically means there are about 30 stages total, but a few levels are duplicated on each side. 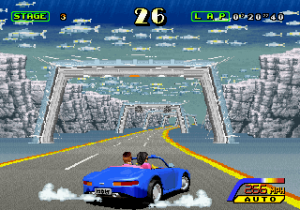 The game plays pretty much the same as the original OutRun, as it loses the turbo button, weather effects and rivals of Turbo OutRun. 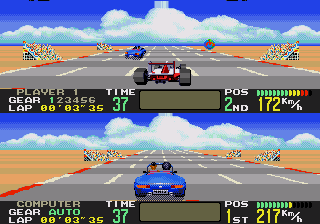 The turning animation for the cars is more pronounced than before, but otherwise the game controls about the same. 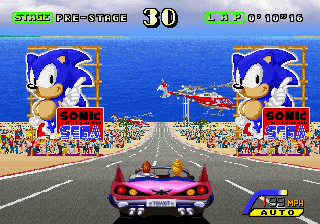 However, the game greatly benefits from Sega’s Multi 32 board, which allows for even faster driving action and smooth-as-hell sprite scaling. For the first time, the road is actually textured, instead of the cycling greys of the earlier games. The backgrounds are incredible and have a lot more detail than any other game, as well as huge hills, which makes the tracks feel less flat. 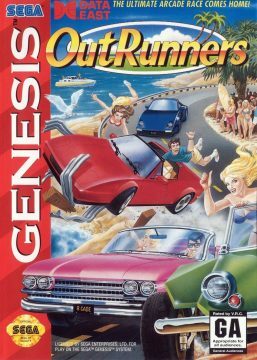 It always keeps up the pace, because even if you hit an obstacle and the drivers fall out, there’s some comical animation as they somehow fly or jump back into the car without it stopping. It’s accompanied by a laugh track and is quite silly. 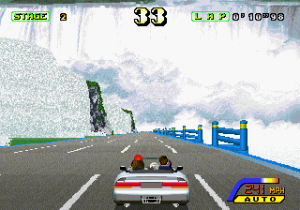 The stages become increasingly more gorgeous as you drive over bridges, near waterfalls, through dense forests, and even underwater. Compared to the lame levels of Turbo OutRun, each stage has a distinct background, and you’ll drive past many famous landmarks. Some of the vehicles even change depending on the stage, as you zoom by covered wagons in the Grand Canyon, blaze past (or through) cyclists in China, or weave between double decker tour buses in Hong Kong. There’s now an in-game radio station select. You can choose from the remixes of the four classic tunes (“Last Wave“ included! ), as well as several new songs. These aren’t quite as good as the originals, but there’s some decent stuff, like “Looking for the Rainbow“. The voice effects are particularly notable as well, especially Jake Elwood (possibly a reference to The Blues Brothers?) as a radio announcer on the car select screen. 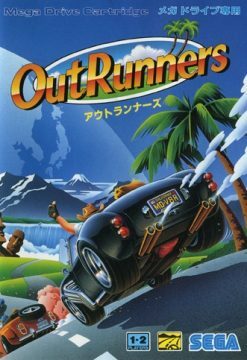 OutRunners is an absolutely brilliant game, and a fantastic update of a classic. But sadly, it never remotely reached the same level of popularity. 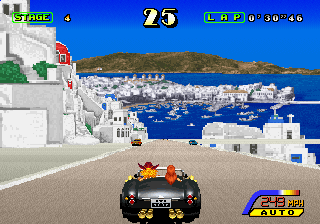 Its only home port was on the Genesis, and it’s rather badly done. The system couldn’t handle the special effects of the original OutRun, let alone this powerful sequel. 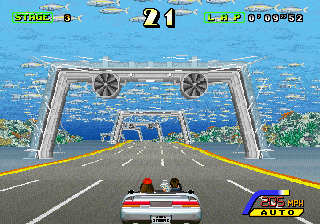 The arcade version featured a fairly impressive rendition of the Golden Gate bridge, but in the Genesis version it looks like any old bridge. 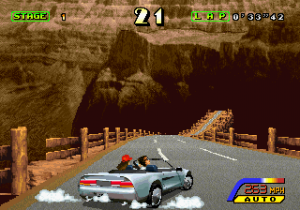 Consequently, the game feels very scaled back, worse than the Genesis version of OutRun. The game tries to include a multiplayer mode by dividing the screen into two halves, but it looks so bad it’s just silly. Worse still is that you always have to play split-screen, even in single-player mode, making the view extremely cramped. This in itself introduces a number of illogical technical conundrums. 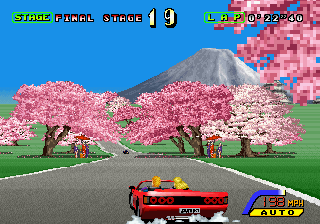 If the CPU player advances to another level before the human player (or vice versa), the entire backdrop changes for both players, even if the other is in a totally different stage. This bizarre situation is presumably because the system couldn’t handle two different sets of graphics on screen simultaneously. In addition to the regular “Arcade Mode“, there’s also an “Original Mode“, which lets you pick any of the levels and race against either another player or a computer controlled opponent. 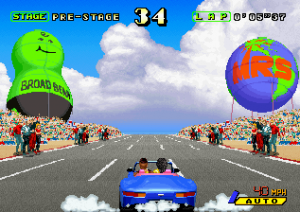 The Japanese version included a cheat code where you could play as the Virtua Formula, the car from Virtua Racing, but this was strangely missing from the American release. Sega didn’t even bother to publish the game outside of Japan themselves, leaving the duties to Data East.